The MVHS members are an active bunch. We financially and physically support our herb garden at Toledo Botanical Garden in Toledo, Ohio. We’ll be adding more photos to our Flickr album (like the one below) as we take them. 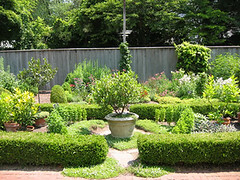 Bay Garden uploaded by herbgardener12. The Bay Garden at the MVHS herb garden at the Toledo Botanical Garden.